For those of you who've never heard of Chicnova, it is a leading online fashion retailer based in Hong Kong. They have a amazing site, updated with nearly 300 new items each week, and they sell many different styles of clothing, shoes, and accessories to keep you updated with the latest in fashion trends. As a bonus, the prices are pretty reasonable too! The package was delivered from Hangzhou, China via EMS and took 10 days to arrive, which is relatively quick for overseas shipping. They gave me a tracking number so I could monitor its location. 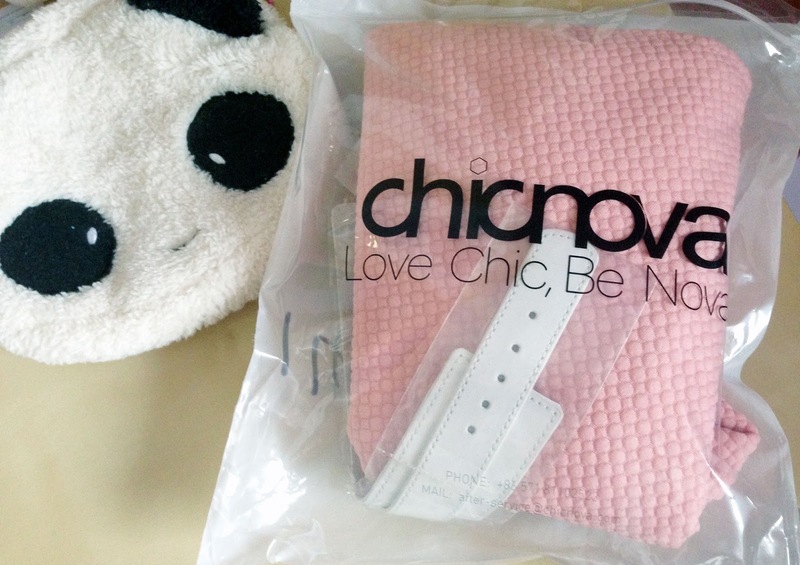 The items came in a paper package and were all arranged neatly in the Chicnova bag. The skirt, tights, and bracelet were folded nicely into a Chicnova bag. 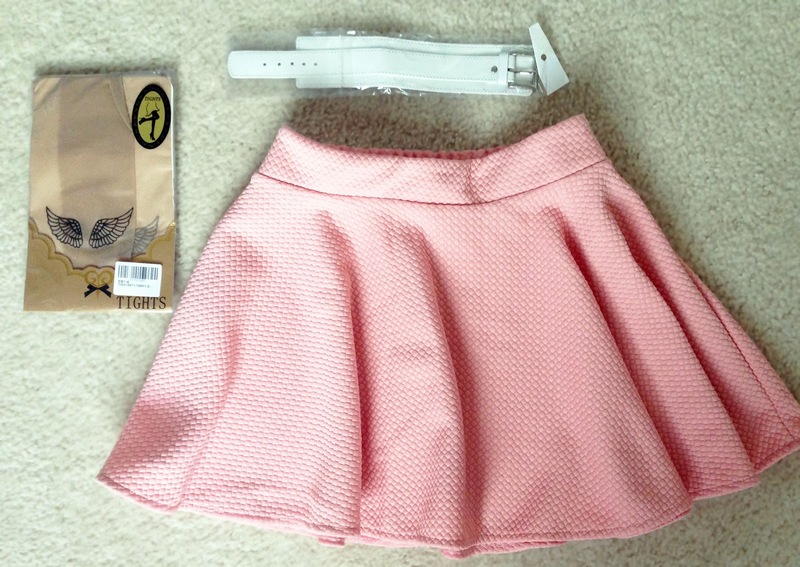 The 3 items I ordered: patterned "tattoo" tights, white leather bracelet, and pastel skater skirt! First off, the pink elastic waist skater skirt. I honestly have to say that this is one of my favorite skirts. It's made of a soft, textured fabric with an elastic waistband in the back, and it comes in many different colors. The quilted texture is more noticeable in the actual product than in the product photos and the shade of pink is slightly less orange-y, but these factors actually make me love this skirt even more. The skirt is one size only, but the elastic waistband allows it to fit a huge variety of sizes. Next, the Chain & Wings patterned tights. These are sheer, skin-tone tights with a "tattoo-like" print. The Chain & Wings Patterned tights. Close-up of the details on the "tattoo" tights from Chicnova. Despite being made of a very thin material, these tights are quite durable. The pattern is printed clearly and doesn't crack or fade when the tights are stretched, so the quality is pretty impressive for just $10. The design, quality, and comfort of these tights completely surpassed my expectations, and for anyone like me who's into "tattoo" style tights, you should definitely look at these or browse through Chicnova's tights selection! Side note for taller girls: I'm only 5'2", so length isn't an issue for me, but these tights are best suited for people between 150-165 cm (roughly 4'9" to 5'5"), so if you're really tall, these might not be long enough. Finally, the white leather bracelet. This bracelet has a buckle that allows you to adjust the length. 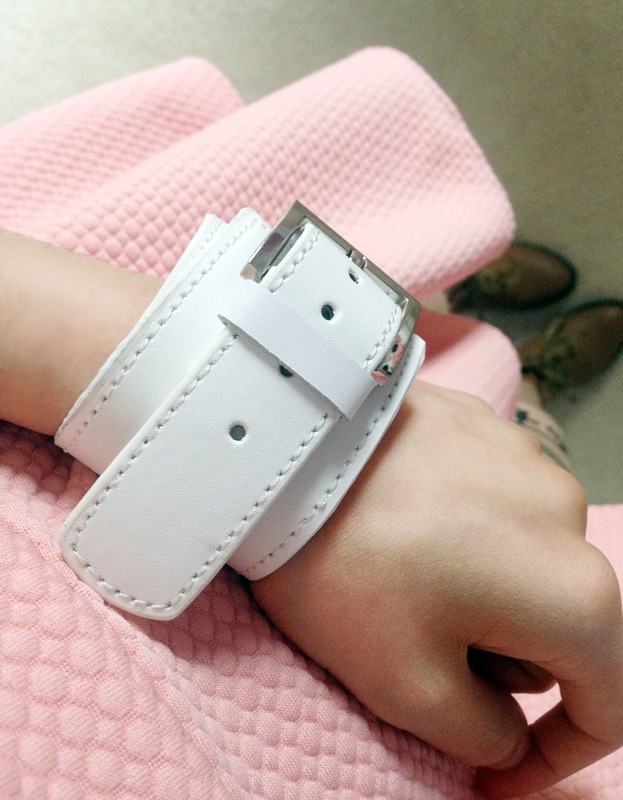 The white wide leather bracelet from Chicnova. The material is similar to that of a leather belt, and the bracelet is very true to photos. It's a bit loose on my wrist even when I tighten it, but it's not loose enough to fall off, so I'm fine with that. This can easily be matched with outfits to add an extra flair! Overall, I was happily surprised with the quality of these items, and needless to say I highly recommend Chicnova to anyone who wants affordable and trendy fashion! Check them out; they have very impressive quality, nice customer service and a HUGE selection of clothing and accessories! Later this week, I'll be writing an OOTD post featuring these three items! Chicnova offers free worldwide shipping, and you get 20% OFF your first order when you sign up via email! Shop now! Thank you so much to Chicnova for sending me these amazing products! I look forward to future collaborations with the store! those tights are so amazing!! I want them so bad!! btw, I'm IN LOVE with your blog! Thank you so much! I'm really glad that you like my blog! They are so beautiful! The boots suit the skirt so well!! This makes me super jealous!! Amazing!! Btw, that tattoo is super cute! !